Kelly Sutton is very unique. She is one of very few woman and the only person with MS that is a NASCAR driver. Racing has always been part of her life. I don't know a lot about racing. But I know it's not an easy profession for people who don't have a chronic illness to deal with. Kelly fell in love with cars at a very young age. As a toddler she would help her dad, Ed Sutton, fix the cars he raced. She started racing at the age of 10. For six years she competed steadily, following in her father's footsteps. Kelly began having tingling and numbness on her right side. Another early symptom was fatigue. She eventually had a spinal tap and and MRI. These showed evidence of MS. In 1988 at age 16, Kelly was diagnosed with relapsing-remitting multiple sclerosis and became deeply depressed. She finally went to a support group at 18 and left crying. She thought she would end up in a wheelchair just like the people she saw at the meeting. Her father and her family wouldn't let her give up on racing. They knew how much she loved it. In 1995, she suffered a major relapse when she crashed her car into a tree. Kelly ended up in a wheelchair at the age of 25, with others having to help her do everything. She finally was able to get out of the wheelchair. However, racing was still out of reach until she met a woman who had MS. Kelly began treatment with Copaxone and went into remission. She also began managing her multiple sclerosis with diet and exercise. 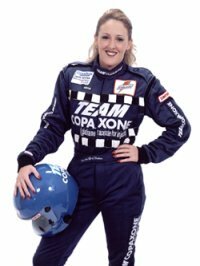 In 1997, Kelly finally began realizing her dream of being a race car driver. She has been racing ever since. She also travels across the country sharing her MS experience with others who have multiple sclerosis. Kelly Sutton has been through so much in her 37 years. She knows there is a purpose for her life. If you'd like to visit Kelly Sutton's website - The Let it Shine Foundation - go here, (clicking link will open in a new window). You can read more about her life and her work with MS. You can contact her there as well as make a donation to help put an end to multiple sclerosis.